*A western PENNSYLVANIA radio institution is succumbing to the economy. For nearly half a century, the call letters "WAMO" - which officially stand for the Allegheny, Monongahela and Ohio rivers that meet in Pittsburgh - have been synonymous with programming for the region's black community, and it was that community that was stunned Friday by the news that Sheridan Broadcasting, which has owned the WAMO stations for more than 35 years, had reached a deal to sell them to an organization called Saint Joseph Missions, bringing an end to the urban-oriented formats on the stations. What Saint Joseph gets for its money is a relative bargain: for $8.9 million, it gets the current incarnation of WAMO-FM, a class B facility on 106.7 licensed to Beaver Falls and serving the northern half of the Pittsburgh market with R&B from a transmitter site in Wexford, as well as two AMs - urban talk/R&B oldies WAMO (860 Millvale), with 1000 watts by day, 830 watts at night and a solid signal over the core of the market, and gospel WPGR (1510 Monroeville), a 5 kW daytimer serving primarily the eastern side of the market. Sheridan spokesman Russell Bynum told the Pittsburgh Post-Gazette, "This was a difficult decision for the owners, but it was a necessary situation for them." "This is a business decision, that's the reality of the marketplace. The marketplace determines how businesses go, and industries have to change with the times," he told the paper. So who is Saint Joseph Missions? According to the statement the nonprofit filed in a 2007 application (still pending) for a new noncommercial signal on 91.7 in Ligonier, it's "organized exclusively for religious, educational, and charitable purposes," in particular those of the Catholic Church. There's little question, then, about what format Pittsburgh listeners will be hearing on 106.7, 860 and 1510 once the sale closes - and no small bit of irony there, since another Catholic broadcaster, Relevant Radio, apparently couldn't make a go out of its lease of a much smaller local signal, WZUM (1590 Carnegie), which has been cycling through several temporary formats in the last few days. At this point, there are still more questions in this deal than answers: will Pittsburgh's black community disregard Bynum's call to inaction and protest the loss of the only minority-owned signals in town? 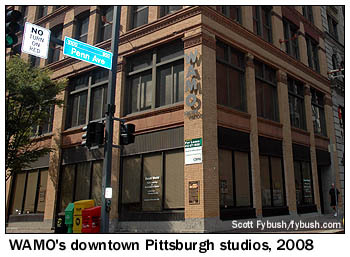 Will another Pittsburgh station flip to WAMO-FM's popular R&B format after 106.7 flips? (Clear Channel's WKST-FM and CBS Radio's WBZW both have significant overlap between their heavily rhythmic top-40 formats and WAMO-FM's playlist.) And what becomes of the rest of Sheridan's station lineup, including Buffalo's WUFO (1080 Amherst) and small AM signals in Birmingham and suburban Atlanta? As always, we'll be following this story closely...stay tuned. *On the other side of the state, the Broadcast Pioneers of Philadelphia are honoring the legendary WIBG (990, now WNTP) with a luncheon/reunion Wednesday. Sam Lit, son of legendary jock Hy Lit, will emcee the event at the Bala Golf Club; scheduled guests include Scotty Brink, Frank X. Feller, Jerry Stevens and Bill Wright, Sr.
Tom Scott has departed the Clear Channel cluster in Williamsport after a nine-year run, most recently as OM/PD of WKSB (102.7), WBYL (95.5)/WBLJ (95.3) and WVRT (97.7)/WVRZ (99.7). In Carlisle, Cumberland Valley Christian Radio has been granted a CP for a new 600 watt/830' DA signal on 91.3. Back in Pittsburgh, there's a new HD2 format on the air at Clear Channel's WXDX (105.9): fans of the Pittsburgh Penguins can follow their Stanley Cup run on 105.9-HD2, which is being programmed by the hockey team with a 24/7 Penguins format, including talk shows, player interviews, and - starting in the fall - broadcasts of the Pens' AHL farm team in Scranton. Speaking of Scranton, veteran jock Paul Grimes died Thursday after a long battle with a brain tumor. Grimes started his career at the old WPTS (1540 Pittston) and worked up and down the dial at WMJW, WBAX, WBRX, WMGS and WSFX. Grimes was just 61. *In NEW JERSEY, WILW (94.3 Avalon) still hasn't followed through on its plans to change calls to WIBG-FM - but "Wibbage-FM" did apply for a power increase and transmitter site change last week. The station's prospective new owner, Rick Brancadora, wants to move 94.3 from its present transmitter site in southern Cape May County to the tower of his WIBG (1020) in Palermo, N.J. In the process, 94.3 would boost power from its present 3.3 kW/300' to 6 kW/299', with a directional notch to the northwest protecting adjacent-channel stations WYSP (94.1 Philadelphia) and WPST (94.5 Trenton). *NEW YORK's Pacifica outlet, WBAI (99.5), is no stranger to management turmoil, and that seemingly endless loop is making another cycle this spring. Pacifica national management removed GM Anthony Riddle from his post earlier this month, and station veteran Bernard White says the 10-day suspension he's serving amounts to an ouster from the PD chair he was occupying. Lavarn Williams is serving as acting general manager as the national Pacifica board tries to get the station back on sound financial footing. A schedule shift at WABC (770): the lone tape-delayed hour of Laura Ingraham that the Citadel talker was carrying from 9-10 on weeknights is gone, replaced by an extra (and apparently local to WABC) hour of Curtis Sliwa's late-night talk show. Over at WWRL (1600 New York), a schedule shift in afternoon drive is replacing Ron Kuby with Air America's new Montel Williams talk show from 3-6 weekday afternoons. It's not on the air yet, but there's a call change on Long Island's new 89.7 signal, as WRMR in Lindenhurst becomes WOBH. Its new sister station on 89.3 in Copiague takes the calls WGSS. Call him "Dr. William O'Shaughnessy": the colorful owner of WVOX (1460)/WVIP (93.5) in New Rochelle received an honorary doctorate from Mount St. Mary College on Saturday, alongside Fox Television Stations CEO Jack Abernethy. Where are they now? Former WXRK (92.3 New York) jock Chris Booker is heading west, taking over middays at CBS Radio's "Amp" (KLSX 97.1) in Los Angeles, the station that was the model for the "Now" CHR format that replaced K-Rock, thus putting Booker out of work in the first place. Over in Utica, we'll know this morning how serious Roser Communications is about the "format change" it's been heavily promoting at its pair of "Kiss FM" top-40 stations, WSKS (97.9 Whitesboro)/WSKU (105.5 Little Falls). The stations garnered lots of publicity late last week when they announced that "financial constraints" were forcing them to flip to a new format at 7:30 Monday morning - but since Kiss is also promising that its airstaff won't be affected, and since there's no mention of the "changes" on its website, it certainly has that "stunt" scent to us. Stay tuned; we'll be listening Monday morning to see what, if anything, happens. CNYRadio.com reports that Ted Bradford is out as PD of Galaxy's Syracuse-market WZUN (102.1 Phoenix) and Utica-market WUMX (102.5 Rome), where he was also doing middays on WUMX and evenings on WZUN. Meanwhile, "Big Mike" Fiss is now the permanent morning man on WUMX, after filling that role on an interim basis. Up the dial, there's a call change as Craig Fox and Sam Furco prepare to get DeRuyter-licensed WWDG (105.1) back on the air under their ownership. When the signal they bought from Clear Channel signs on again - any day now, we're told - it will revert to the WVOA callsign it used under Fox's previous ownership. That call, and the "Love Radio" religious/Spanish format 105.1 will once again be using, has been on the lower-powered 103.9 in Mexico, near Oswego. 103.9 will simulcast with 105.1, just as it did in the previous era of "Love Radio." Back then, 105.1 was WVOA and 103.9 was WVOQ; this time around, 103.9 will be WVOU. 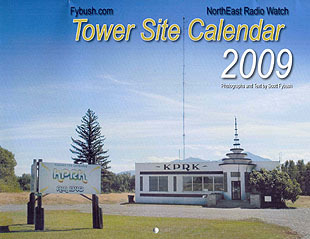 The FCC has issued construction permits for two new noncommercial FM stations: in Milford, north of Oneonta, SUNY Oneonta gets 100 watts/731' DA on 88.5, while in Dolgeville, east of Utica, Northeast Gospel Broadcasting, owner of WNGN 91.9 Argyle, gets 800 watts/-249' DA, also on 88.5. Budget cuts have claimed the job of WPXY (97.9 Rochester) night jock Kasper; he's been replaced by Raphael on the Entercom top-40 station. Across the street at WXXI-FM (91.5), one of Rochester's longest-running DJs closed out his 33-year career at the public radio station in true public radio style: Simon Pontin's final weekday "Sunshine Show" Friday morning capped WXXI's weeklong pledge drive, with more than $35,000 in pledges coming in just during that last morning show to help push the station over the top of its $150,000 goal. 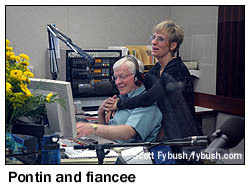 After the big celebration Friday, Pontin returned Saturday for one last "Salmagundy," his weekend show of poetry, storytelling and musical oddities - and somewhere along the way, we learned that he's now engaged to his girlfriend, Christine, with an October wedding date set in New Mexico. Back in the days before overnight AM radio became a nonstop sea of satellite-fed "Coast to Coast AM," Rochester's WHAM (1180) was one of the most distinctive sounds on the dial after 1 AM, when its talk shows gave way to jazz music. From 1969 until 1978, Harry Abraham was the master of those late-night hours on WHAM, and his "Best of All Possible Worlds" show had a following that stretched far beyond western New York. Abraham ended up in Philadelphia after WHAM dropped his show in favor of more conventional overnight programming; last week, WHAM reported that Abraham had died there on May 7, at age 64, after a battle with cancer. *In eastern MASSACHUSETTS, WMFP-DT (Channel 62/RF 18) is changing programming. After two years of all-infomercial programming, the Multicultural Television-owned station is picking up RTN's lineup of classic sitcoms and dramas. WMFP-DT recently lit up a subchannel on 62.2; presumably that's where at least some of its infomercials will be going. After 26 years, the Sunday "Jazz Brunch" show on WFNX (101.7 Lynn) is history; host Jeff Turton at least got to do a farewell show last weekend after learning the show was being cancelled. Turton tells the Herald he was told "the current economic times" were to blame for the cancellation. Calvary Chapel of the Berkshires has been granted a construction permit for a new FM in Dalton. The 175-watt/948' DA signal will operate on 91.7. Sherman Baldwin is back in the Berkshires; after a stint as PD/afternoon talker at Albany's WROW (590), the former WUPE air talent is now doing afternoon talk at WBRK (1340 Pittsfield). And back in Boston, WGBH has relit the giant LCD screen that promotes its Allston Landing studio location to drivers passing below on the Massachusetts Turnpike. The Globe reports that cooling fans have been installed to fix the overheating issues that forced the screen to go dark last year; a lawsuit is still pending to figure out who'll pay for the repairs. *A former CONNECTICUT callsign is back on the air in the Hartford market. Now that John Fuller's Red Wolf Broadcasting has taken control of WURH (104.1 Waterbury), the station is returning to the WMRQ, "Radio 104" identity it used from 1995-2003. New studios for the station are under construction in Glastonbury, with programming coming temporarily from Red Wolf's eastern Connecticut studios. One "Channel 104" staffer didn't make the transition to the new ownership: programming coordinator Michael Czarnecki is staying on the Clear Channel side of the split, moving over to handle programming at WKSS (95.7 Hartford). *For RHODE ISLAND listeners, this morning marks the debut of the "Matty in the Morning" show on Clear Channel's WSNE (93.3 Taunton MA), which is picking up the long-running program from Boston sister station WXKS-FM (107.9 Medford) a couple of weeks after ditching its own local morning show with Tad Lemire. *The NEW HAMPSHIRE Association of Broadcasters has a job opening posted for "morning co-host" at WSCY (106.9 Moultonborough), and that means JR is departing after 14 years as the local wake-up jock at "Today's New Hit Country" - and after 20 years in Granite State radio. In Keene, we're hearing that Saga has flipped translator W281AU (104.1) back to a simulcast of talk WKBK (1290) after a few months with classic rock fed from an HD subchannel of WKNE (103.7). *In MAINE, Bob Bittner is changing the calls of WWBK (900 Brunswick) as he prepares to sell the station: it's going back to its original callsign, WCME, now that those calls have been freed up in nearby Boothbay Harbor. Up north in Norway, Richard Gleason's WOXO (92.7) is increasing power. It's been granted a construction permit to increase from its present class A status, with 2 kW/360', to 5.2 kW/735' as a C3, moving to a new transmitter site on Shaw Ledge, northwest of Norway. From the new site, WOXO will have improved coverage of Lewiston and Rumford. Augusta-based Light of Life Ministries has been granted construction permits for two more FM signals in the Pine Tree State: in Fryeburg, it will be on 91.5, with 430 watts/1269', while in Ellsworth, it's been granted 2 kW/190' on 91.7. The new signals join Light of Life's existing signals in the Augusta market (WMDR 1340, WWWA 95.3, WMDR-FM 88.9), as well as four other unbuilt CPs and several pending applications around the state. *In CANADA, the CRTC has approved My Broadcasting's application for a new 650-watt adult contemporary station on 100.9 in Brighton, Ontario. The latest link in the "My FM" chain of small-town signals will knock CKJJ-FM-1, UBC Canada's 42-watt Cobourg relay of CKJJ (102.3 Belleville), off the frequency, but My says it will work with UBC to find an alternate frequency for that Cobourg signal. The CRTC also approved My's application to buy CIYN (95.5 Kincardine) from its current owners, Brian Cooper, Daniel McCarthy and Haliburton Broadcasting. The deal is valued at C$1,126,520 - but only after the CRTC objected to a provision of the sale agreement that would have added an extra C$125,000 if My received approval within nine months for a CIYN relay transmitter in Port Elgin. The station's current owners had received permission for such a relay, but never built it; the CRTC denied My's re-application for the signal on 90.9, and it says My can't apply again within nine months, in order to prevent any "signal trafficking" questions. CTVglobemedia has promoted CHUM-FM (104.5 Toronto) PD David Corey to national director of music programming - and while we're on the national level, we note that CBC Radio is again shifting its schedules, cutting local noontime shows on CBC Radio 1 to one hour, adding rerun programming in mid-afternoons on Radio 1, and adding an extra hour, from 9-10 AM, to Radio 2's midday classical block. If a PENNSYLVANIA shock jock plays a racially inflammatory song parody on his show March 21, does it make an impact? In the case of Kidd Chris, morning personality at CBS Radio's WYSP (94.1 Philadelphia), the answer would appear to be "yes - but not until almost two months have passed." Back in March, the show played a parody song called "Schwoogies," which crudely stereotyped blacks. And while the song was reportedly played several times on March 21 and at least once more on March 24, CBS Radio management apparently didn't learn about it until sometime very late last week. Calling the song "highly offensive and completely inappropriate for broadcast on our airwaves," WYSP fired Kidd Chris (real name: Chris Foley) and PD John Cook, and quickly cancelled a widely-publicized birthday party for Foley that had been set for Friday night. It looks like anchors Chuck Darling and Kelly Carr are out of work at Pittsburgh's WURG-TV (Channel 9), now that - what's that? Oh, right...WURG is the fictional Pittsburgh TV station on the Fox sitcom "Back to You," which was cancelled last week, the victim of mediocre ratings, frequent timeslot shifts, the writers strike and probably Fox's general difficulty sustaining sitcoms. There's been some talk of a revival of the series over at CBS, but the outlook appears dim. A RHODE ISLAND jock is heading west to CONNECTICUT: we hear Robby Bridges is departing morning drive on Hall's WCTK (98.1 New Bedford MA/Providence RI) and moving into afternoons at Cumulus' WEBE (107.9 Westport CT), filling the gap Peter Bush left last month when he departed WEBE to pursue his auto racing career. And going the other way, Chris Duggan moves from the PD chair at WDAQ (98.3 Danbury CT) to be PD at Clear Channel's WWBB (101.5 Providence)/WSNE (93.3 Taunton MA), replacing Rick Everett there. The growing trend of AM stations obtaining special temporary authority to relay their signals via FM translators has reached southwestern NEW HAMPSHIRE. That's where Saga is now rebroadcasting talker WKBK (1290 Keene) on W278BG (104.1) and standards WZBK (1220 Keene) on W275BI (103.1). Both translators have been shuffled around the dial, and both will have new calls soon. The 103.1 signal uses 250 watts, while 104.1 has 59 watts, both from the WZBK tower in Keene. Nick Berg's name and his tragic story have been all over the national headlines this week - but for many radio folks in PENNSYLVANIA, NEW YORK and NEW JERSEY, the tower worker who was beheaded in Iraq is more than just a name in the papers. Before Berg headed over to Iraq earlier this year, he was up in the air (and down on the ground) at tower sites all over the region, operating as "Prometheus Tower Service" at sites that included Ingraham Hill in Binghamton (where he installed the new WHWK 98.1 antenna, apparently his last job in the U.S.), WNGZ in Montour Falls, N.Y., the New Jersey Meadowlands and WPLY in Philadelphia. We're keeping tabs on an industry effort to create a scholarship in Nick Berg's memory, and we hope to have details to provide by next week's issue. There's a new FM station on the air in NEW JERSEY: WJPG (88.1 Cape May Court House) signed on a few days ago, simulcasting the contemporary Christian music of WJPH (89.9 Woodbine). Some talent on the move in upstate NEW YORK this week: at Clear Channel's WYYY (94.5 Syracuse), the husband-and-wife morning team of Pete Michaels and Brenda Bisset are out after three years, replaced by Rick Gary (of sister station WIXT-TV) and Kathy Rowe, who moves to mornings from middays. Replacing Rowe is Marne Mason, formerly of Galaxy's WTKW (99.5 Bridgeport)/WTKV (105.5 Oswego); she'll also be Y94's assistant program director. And replacing Mason alongside Glenn "Gomez" Addams in mornings on TK99 will be Galaxy programming honcho Mimi Griswold. Big news from eastern MASSACHUSETTS, and you read it first here in NorthEast Radio Watch: this fall's schedule at WBZ-TV (Channel 4) in Boston won't include news at 5 PM weekdays. Instead, NERW has learned that "CBS4" plans to move Dr. Phil from 3 PM to 5 PM (it can't air at 4 PM, against Oprah on WCVB Channel 5), where it will replace the hour of news that's been airing there for years. WBZ will then launch a 4 PM newscast to challenge WHDH-TV (Channel 7), which now has the local news audience to itself that early in the afternoon. Out in western Massachusetts, Vox closed on its $2.025 million purchase of the three Berkshire Broadcasting stations last week, adding WNAW (1230 North Adams), WMNB (100.1 North Adams) and WSBS (860 Great Barrington) to a cluster that already includes WUHN (1110 Pittsfield), WBEC (1420 Pittsfield), WUPE (95.9 Pittsfield) and WBEC-FM (105.5 Pittsfield), though the latter has a pending application to move out of the market to Easthampton. Our top story this week comes from CANADA, where the CBC has departed the AM dial in Montreal after 77 years. On Thursday, listeners to CBM (940) heard programming interrupted every ten minutes by a recorded announcement to switch to FM beginning at midnight. When the hour arrived, CBC Radio One programming was interrupted mid-promo for a repeating loop directing listeners to "88.5 on the FM dial" -- CBME, the 4000-watt replacement for CBM's booming 50-kilowatt class-A signal. The loop then ran for 24 hours, ending with no fanfare at midnight Friday. The CBC seems to already realize that the 88.5 signal is inadequate to reach the old CBM audience; they asked the CRTC this week for permission to boost power to 16900 watts (presumably directional to protect adjacent-channel WXLU 88.3 in Peru NY and WWPV 88.7 in Colchester VT), and they're reportedly being deluged with calls from listeners who can't hear the FM replacements. Plenty of changes this week in Albany, beginning at WKLI (100.9)/WKBE (100.3 Warrensburg), which has started using the "Point" nickname that briefly surfaced across town at 104.9 earlier this spring. We hear a new jock lineup will be unveiled soon to go along with the modern AC format.